I might have a glass of beer: Kölsch brewer breaking the Kölsch-Konvention? The Kölsch-Konvention is a formal agreement signed in 1986 by the 24 then existing Kölsch brewers. It defines what Kölsch is: a pale, highly attenuated, hoppy, clear, top-fermenting beer with an original gravity of between 11 and 16 degrees Plato. It also regulates the glasses used in Cologne to serve Kölsch and some of the language Kölsch brewers are allowed to use. While reading this to double-check that I'm not mad, I was reminded of the equally strict restrictions on how Kölsch brands can be named. Basically you can only call your beer Kölsch, without any additional descriptions — this is to prevent all the "Premium-Pils" and "Ur-Weizen" nonsense that you see with other kinds of beer. It does have one side-effect. It effectively stops a brewery having more than one kind of Kölsch in its line-up. There's no way to differentiate them. This didn't seem to be a problem until recently when the German mass market was overcome by a wave of bland, flabby so-called "Gold" beers, less bitter than Pils, which appear to have found plenty of buyers. 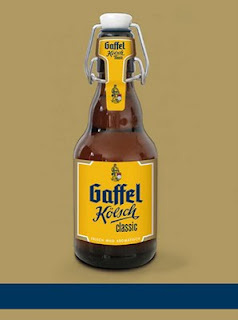 Now the Gaffel brewery has a new beer in its lineup called "Kölsch classic" in addition to the regular Kölsch, aimed squarely at this market. It's 15% less bitter than the standard Gaffel Kölsch. The only problem there is that its chosen name appears to violate the Kölsch-Konvention. In particular the term "Kölsch" may not be used together with any further additions which tend to water down the geographical designation of origin (for example, but not exclusively, "Genuine Kölsch", "Original Kölsch", "Original Kölsch", "Cologne's Kölsch") or with other geographical additions (for example, but not exclusively, Rhine Kölsch, Mountain Kölsch) or in connection with other descriptors, brand names, trade marks, designs, design elements, companies, subsidiaries, company slogans, company abbreviations, beer descriptions, beer types or any other additions which are directly or indirectly misleading apropos the geographical origin, or which could lead to confusion or to a watering-down of the term (for example, but not exclusively, Special-Kölsch, Super-Kölsch, Top-Kölsch, Premium-Kölsch) or to any other violations of the law against unfair competition. Insofar as it be necessary for legal reasons to state on the label the location of a brewery of origin outside the city boundaries of Cologne which bears rights of precedence in the sense of §1 paragraph 2 sentence 3, the statement of the location of the brewery must not mislead or lead to any kind of watering-down of the geographical designation of origin "Kölsch". Ironically the boss of Gaffel is the current head of the Cologne Brewery Association which got all the Kölsch breweries to sign up to the thing in the first place. Very interesting. I'd quite like it if you get a couple of variations on a theme in some of those Cologne pubs, to be honest, although I'd rather they upped rather than reduced the bitterness! Gaffel's PR man was asked for a comment, but has not replied (I've always wanted to say that). "The description Gaffel Kölsch classic does not water down the typical substantial Kölsch character in the spirit of the Convention; on the contrary, it emphasises it. The important thing is that the naming of Kölsch in the spirit of the Convention should not lead to an exaggerated or superlative description (like Super-Kölsch or Premium-Kölsch), but should convey the typical character of Kölsch."